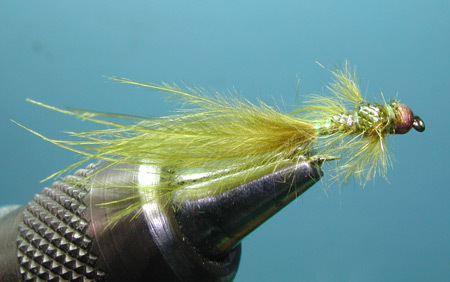 Sierra Fly Company came up with a nice pattern that is being sold within fly shops throughout the West. It is called a Dancing Damsel and has a variation called a Dancing Callibaetis. Many of the features are used within other damsel nymph patterns such as a sparse, long marabou tail that is about twice the length of the hook. The body is tightly dubbed with a Krystalflash ribbing. A wingcase is constructed over the thorax and part of the body with gills protruding from the base of the thorax and legs projecting from behind the bead. 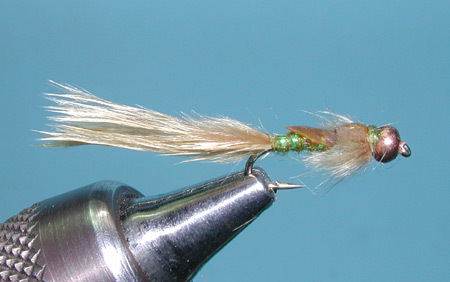 The bead provides the weight for jigging action and is sufficient size to represent head of the nymph.